Cub Scout packs, Boy Scout troops, and Venturing crews throughout the Council will be distributing Scouting for Food donation door hangers in local neighborhoods. They return to collect those items one week later. Sat, April 6 - Deliver door hangers to homes throughout your town. Sat, April 13 - Pick up food donations and bring out to the Council. We will have plenty of containers to fill. You can also sign up online to take donations at one of the 5 area Hyvee's. 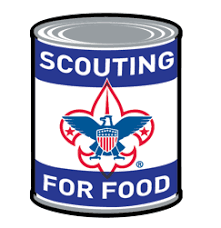 If your unit is planning on participating in Scouting for Food 2019, just stop in to pick up your door hangers.